To observe nature in its most pure and untouched state, Big Talbot State Park on Amelia Island is the place to be. 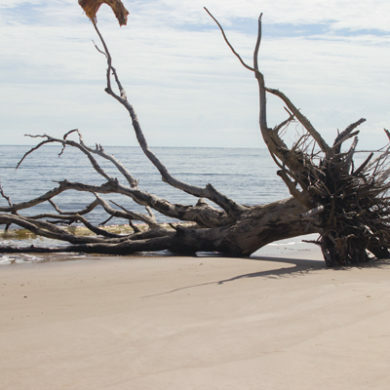 Named after Charles Baron Talbot, the Lord High Chancellor of England, Big Talbot Island State Park is the perfect location for outdoors enthusiasts and recreational activities. The island habitat was originally inhabited by the native Timucua tribes. This makes for a great historical and learning opportunity while walking the same trails and coasts the Timucua natives did. Have a boat that you want to get underway? Big Talbot Island has a boat ramp on site that is open to the public. But don’t worry about leaving shore if you’re without a vessel because Big Talbot Island plays host to some great fishing just off the coast. If you prefer self-propelled to motorized, Big Talbot Island is one of the premier locations for kayaking in the Amelia Island area. Explore the delicate ecosystem along the coast while watching for birds and other marine life in the area. If scaling The Bluffs and making a journey down to the beach seems like too much, there are plenty of places for a picnic at the top of The Bluffs beneath the mossy canopy. It’s also a perfect opportunity to take in the breathtaking view of Boneyard Beach–you’ll want to have a camera ready! Go all-natural at Big Talbot Island State Park. Big Talbot Island State Park is located on State Road A1A North Jacksonville, FL, FL 32226. For more information, visit the Big Talbot Island State Park website or call (904) 251-2320.